Radio IBS Liberty is an alternative public radio network founded in 1986 in Leeds, West Yorkshire, and Speyer am Rhein, Germany, as as part of the Independent Broadcasting Service Liberty. It is an international media network with about 12 affiliated television and radio programs. Radio IBS Liberty is also known as Radio IBS Leeds. Radio IBS Liberty and IBS Independent Broadcasting Service Liberty are independently operated, non-commercial, listener-supported radio stations in the United Kingdom and in Germany that is known for its liberal political orientation. It is operated by the IBS Independent Broadcasting Service media network with support from a small company based in London, and others. Radio IBS Liberty is also producing educational radio and television programs for an inter-religious understanding such as faith programs about the Jewish, Muslim, Christian faith and religion and others. The idea to produce such programs in the German language and in the English language came through an inspiration through another radio program produced by BBC London (British Broadcasting Cooperation). In 2006 the co-operation with the international independent media project Liberty and Peace NOW! Human Rights Reporters has been launched and Radio IBS Liberty providing news stories and radio programs in association with Liberty and Peace NOW! Human Rights Reporters. As in the year of its foundation, Radio IBS Liberty is still operating under low, and even zero, budget conditions. The radio programs have been heard by listeners from about 40 different countries. Radio IBS Liberty has its own radio archives, housed in France, United Kingdom, Germany and other countries. Radio IBS Liberty and IBS Independent Broadcasting Service Liberty which is also known as Radio IBS Leeds, IBS Television Leeds (because of the place of its foundation) was founded in 1986 by the journalist and author of five books Andreas Klamm. He is also known as a pacifist. After the completion of his entire military service with the German Air Force in 1988-1989 for 15 months he filed for conscientious objector status, which was denied by German Military authorities. The grandfather of Andreas Klamm is the ‘former FRENCH ARMY OFFICER Haedi Sabaot and a French citizen, which brought the journalist, broadcast journalist and author in a serious conflict and caused him to start to think about the situation what could happen if there would be another war between France and Germany. The French Army Officer Haedi Sabaot is missing since 1945 after World War II. The founder of IBS Independent Broadcasting Service Liberty has joined other conscientious-objectors. Andreas Klamm is working since 1984 as a journalist, broadcast journalist, radio and television producer and author. His grandmother has left in 1950 Germany for ever and became a citizen of AUSTRALIA in the city of Melbourne, State of Victoria. He believes that international understanding could help to avoid wars and other conflicts. 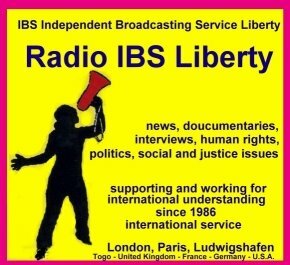 Radio IBS Liberty and IBS Independent Broadcasting Service Liberty was founded in 1986 by the journalist and author Andreas Klamm, who is still director. The service has aired its own television productions from New York City in 2001 / 2002 related to the attacks on the World Trade Center. Radio IBS Liberty has aired its own television productions from New York City in 2001 / 2002 in the United States of America related to the attacks on the World Trade Center during a special coverage. Director of IBS Independent Broadcasting Service Liberty and Radio IBS Liberty is since 1986 Andreas Klamm. In 2000 new radio and television productions called “XXL-info.Compact”, “XXL-info. Gesundheit”, “XXL-info.Culture” and other programs have been launched and got international attention even in countries such as Japan. In 2000 new radio and television productions called “XXL-info.Compact”, “XXL-info. Gesundheit”, “XXL-info.Culture” and other programs have been launched and received international attention. Radio IBS Liberty is also producing educational radio and television programs for an inter-religious understanding such as faith programs about the Jewish, Muslim, Christian faith and religion and others. In 2006 a co-operative project with the international independent media project Libery and Peace NOW! Human Rights Reporters was launched, providing news stories and radio programs. Since 1986 Radio IBS Liberty has produced news and information programs. In 2000 several new radio and television programs were launched. Since 2006 the radio and television program Liberty and Peace Now! Human Rights Reporters has been produced in co-operation with the international media network of the same name. Most of the radio and television programs a are produced as an independent talk show or program that covers democracy, human rights and justice issues. In many cases the television and radio programs produced on the Radio IBS Liberty / IBS Independent Broadcasting Service Liberty media network are a compilation of news, interviews, and documentaries. Some of the programs produced by IBS have been aired on different public-access television stations. Since 2006 production has largely taken place in London, Paris, and close to the city of Ludwigshafen in Germany. All productions are available at a fee as audio files for listeners want to order copies of any programs. Since 1986 Radio IBS Liberty is producing news and information programs which do support international understanding. In 2000 several new radio and television programs have been launced such as “XXL-info. Compact”, “XXL-info. Culture”, “XXL-info. Pflege und Soziales”, “XXL-info. News”, “XXL-info. Special” and others. Some of the programs produced by the staff of Radio IBS Liberty and IBS Television Liberty has been aired on different public access television stations. Productions in London: Since 2006 many of the radio and television productions by Radio IBS Liberty, IBS Television Liberty, the IBS Independent Broadcasting Service Liberty are produced in London, United Kingdom, Paris (France) and close to the city of Ludwigshafen (Germany). All radio productions are available as mp3-files /wav-files for people which want to order the productions (the fees for DVD´s and delivery have to be paid), as Radio IBS Liberty is operating its international radio and television productions under NO- and / or LOW-Budget conditions. Radio and television programs by Radio IBS Liberty, IBS Television Liberty and the international network IBS Independent Broadcasting Service Liberty have been produced in Leeds, London, United Kingdom, Paris, France, many different places in Germany, New York City and other places in the United States of America and in the city of Stockholm in Sweden. Television and radio productions have been produced recently also about special events such as in December 2008 in Stockholm in Sweden about the Right Livelihood Award which is known as the Alternative Nobel Prize and about the journalist Amy Goodman from Democracy Now! (an independent television and radio news hour) which is the first journalist which has received the Right Livelihood Award with her sister laureates Dr. Monika Hauser (Swiss-Italian, founder of Medica Mondiale, Germany), Asha Haji Elmi (a female politician from Somali), Krishnammal Jagannathan, which is referred with her husband Sankaralingam Jagannathan as the “Soul of India”. During the G8 summit in Heilgendamm Germany in 2007 more than 12 independent television and radio productions have been produced and broadcast for Radio IBS Liberty and IBS Television Liberty. On the radio and television programs produced and which have been broadcast with Radio IBS Liberty and IBS Television Liberty have been people like Graf Oldag von Schwerin, Jürgen Trittin, Franz Müntefering, Gerhard Schröder, Kurt Sturm, Dr. Bernhard Vogel, Dr. Heiner Geißler, Cephas Bansah, Axel Buchholz, Prof. Dr. Hubert Rohde, Martina Schmidt, Peter Hoffmann, Judy Bailey, Lothar Liebig, Hans-Carsten Hansen, Michael Elster, Gerhard Stratthaus, Ulrike Folkerts, OB Dr. Wolfgang Schulte, Dr. Ernst Bartholomé, Werner Schröter, Werner Schineller, Kurt Beck, Robin Beck from New York, which is also know with The Coca Cola Commerical “The First Time”, Tonnic, Diva and musician, Sirley McGordon, London, Gerhard Widder, Walter Altvater, Elke Anita Dewitt, Elaine Hudson, Sängerin, Chuck Truitt, Hans-Jürgen Graf, Petra Karl, Martin Behrsing, Thomas M. Müller, Wolfram Sondermann, DJ Moquai, Kenneth Ross, Michael Elster, Manfred Letzelter, Lutz Pauls, Martin Stadlmaier, Theo Magin, Dr. Eva Lohse, Prof. Klaus Töpfer, Ulla Jelpke, Frank Petersen, Michael Heise, Hans Jürgen Ladinek, Professor Heiner Bielefeldt, Ilja Seifert, Claudia Kleinert, Dirk Niebel, Stefan Dallinger, Wolfgang Bantz, Wolfgang Schumacher, Jaqueline Kraege, David Gallup, President of World Government / World Service Authority, Washington, D. C., United States of America (www.worldgovernment.org), Gabriel Goldberg, M.A, Jerusalem, Israel, Dr. Herbert Hillel Goldberg, Jerusalem, Israel, Editor of “Haschiwah”, Sonja Wiegand, Claudia Leistner, Dirk Niebel and many other people which are known in Europe and in many different places in this world. Television and radio productions have also been produced about special events such as the Right Livelihood Award (known as the Alternative Nobel Prize) and about the journalist Amy Goodman from Democracy Now!. During the G8 summit in Heiligendamm Germany in 2007 more than 12 television and radio productions were produced and broadcast. This international service is provided by IBS Independent Broadcasting Service Liberty, Radio IBS Liberty and IBS TV Liberty, a multi-cultural, alternative, independent and international media network which has been founded in 1986 by the journalist, broadcast journalist and author of seven books, Andreas Klamm. Radio IBS Liberty (Leeds), IBS TV Liberty and IBS Independent Broadcasting Service Liberty is supporting international understanding since 1986 and is supporting journalists, media staff and people with disabilities.